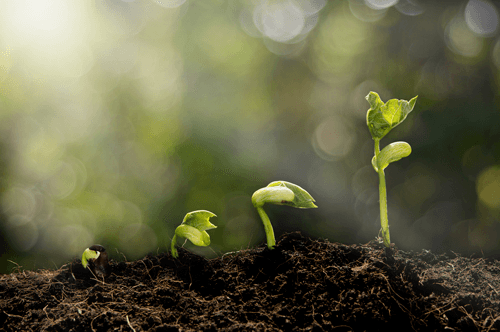 When you want to improve your landscaping and increase the amount of grass you have on your property, you typically have two options – add some grass seed or put down sod. Grass seed comes in a variety of different types and allows you to fill in thin areas or grow an entire lawn over the course of about two years. Sod gives you an instant lawn without any of the waiting involved with seeds. Both will eventually produce a lush, green lawn when well cared for, but they do have several differences. Below, we’ll explain these differences to help you make a more informed decision for your property. In both the installation of seed and sod, there is some preparation required for the lawn. In either case, there may need to be the removal of old, dead grass, rocks, tree stumps, or fallen leaves. Also in both cases, the soil may need to be prepared to handle the addition of the new grass. Herbicides may be necessary to control weeds, while nutrients may need to be added to help the grass grow. The cost of this soil preparation is normally included in the cost of the seed installation, but if the ground is in poor condition, it may cost an additional $2 per square foot. The cost of soil preparation with sod is generally less, around $0.40 to $0.60 per square foot. Seed is fairly easy to lay once the soil is prepared. The grass seed is added to a spreader and laid evenly over the ground before being raked in. This process typically costs around $150 to $700 depending on the size of your lawn and the amount of preparation work, with an average cost per square foot of $0.14 for labor, with a small garden costing about $150, and a 5,000 square foot lawn about $700. 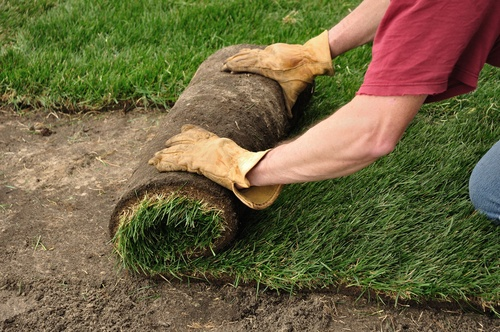 Sod can be laid out in rolls or squares, as well as smaller plugs to fill in sparse areas. Like seed, the labor cost is generally priced per yard rather than per foot, with a 5,000 square foot yard costing between $1,250 and $3,000 in labor or $0.25 to $0.60 per square foot, depending on the amount of preparation required. Both seed and sod have a range of prices depending on the type of grass installed. Seed is much less expensive than sod, not only to install but also to purchase. Most grass seeds range between $65 and $105 for enough to cover a 5,000 square foot lawn, costing roughly $.08 per square foot. Sod is considerably more money, costing between $1,250 and $4,250, or $0.69 per square foot on average, to cover the same 5,000 square foot lawn – roughly a 30% to 42% increase in the cost of the material. Both seed and sod come in a range of different grass types, including fescue 1 and Bermuda. Seed is typically available in a wider range of options than sod, however, giving you more choices for color, hardiness, and lushness of the lawn. Seed does take up to 2 years to fill in completely, however, while sod will give you a new lawn within one day. Because seed takes much longer to cover a lawn completely, weeds may mix in with the grass over time, which can ruin the initial appearance of the lawn and may require the use of herbicides. Because sod is fully grown grass with no weeds introduced, it doesn’t require the same amount of care. When adding seed to your lawn, the best time of year is during the cooler fall months. The warm days and cool nights help the grass grow quickly, putting down roots that will help it come up stronger in the spring. Keep in mind that it will be several weeks at least before you see the grass begin to grow and around two years before you will see the final results of a fully mature lawn. For homeowners wishing to get an instant lawn, sod is the better choice. Sod can be laid in the spring or fall, but should not be laid in the winter months. It will take the sod roughly two weeks to put down shallow roots after it is laid; it is best not to walk on the sod during this period of time. Over the next 30 days, the sod will put down deeper roots, establishing itself in your lawn. Both seed and sod have some degree of maintenance after laying. Sod will require daily watering for the first two weeks to encourage the roots to grow. It should be cut after 45 days when the grass is dry to prevent ripping it out, with the mower set to 3 inches in height. Seed may have a greater degree of initial maintenance than sod. Seed also requires daily watering, but it also requires a weaning period from daily watering so that the new grass does not become stunted. In addition, the seed should not be watered all at once. Instead, apply half the water, wait an hour, then apply the rest. Otherwise, the seeds may be washed away. Seeds may also require special fertilizers meant for new lawns for the first few months before switching over to a fertilizer made just for grass. Fertilizing too soon may actually cause the weeds to grow more quickly than the grass, therefore fertilizers mixed with weed-controlling herbicides are recommended. If the soil in the area you are planting is experiencing erosion, sod can be installed as a form of erosion control. A biodegradable mat is first secured to the soil to help prevent any further displacement. The sod is installed on the mat, then as the roots grow, the mat degrades and allows for the roots to help anchor the soil. Seed cannot be used for this purpose, as the length of time it takes to put down roots cannot stop erosion quickly enough. How much does it cost to install sod or seed in my city? Cost to install sod or seed varies greatly by region (and even by zip code). To get free estimates from local contractors, please indicate yours. 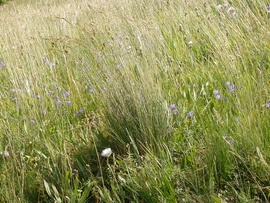 Cost Considerations: Compared with other lawn grasses, the cost to establish fescue is in the mid to low range. It costs $0.25 to $0.70 per sq. ft.